Our super high output snow machines will produce lots of artificial snow at your next holiday party or event. 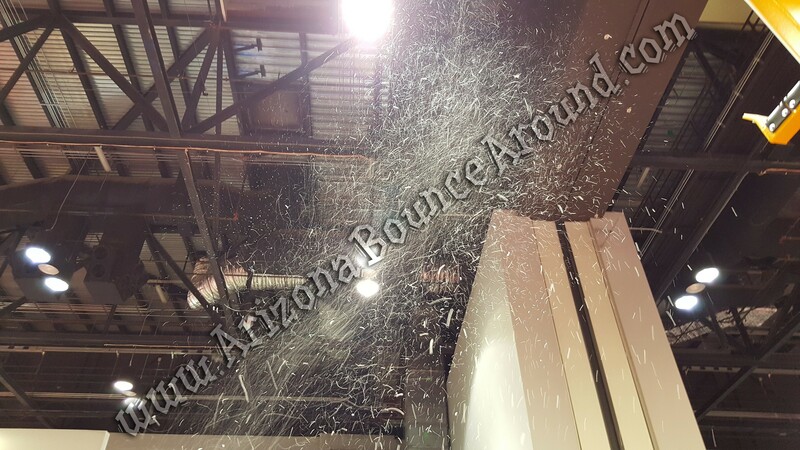 The fake snow will go flying out of our artificial snow machine and shoot 30 to 75 feet in the air. If you're looking for artificial snow for parties and events then you just found the most powerful artificial snow blowing machine in Colorado so be sure to check out the video below. The artificial snow is basically small pieces of non-toxic foam that will disappear after a short time on the ground and has the real look of snow fall. The snow fluid will not stain and is 100% biodegradable. It will make hard floors slippery during use because of the high output. Our snow fluid is sold for $8.99 per liter and not included in the rental price. We also sell our snow fluid in 5 liter bottles for $37.95 or 20 liter bottles for $139.00. It may be better to buy the snow fluid in bulk for this high power snow machine. This artificial snow machine will use around 8 to10 liters of snow fluid every hour. You don't even need to know how to make snow because we have it all ready to rent in a pre mixed portable snow machine available for customer pickup or delivery. This is a very high power snow blowing machine so it will be loud and require electrical power to operate. If you're in an area without electricity we do rent generators that will power the snow machine so please call a party planner for proper generator size if you need to power other items. We also rent smaller snow machines and lots of other holiday party rentals like snow globes, tables and chairs, heaters, outdoor movie screens, holiday trains and sleigh rides.